Through frequent hair-washing, coloured, tinted or highlighted hair loses its colour. It needs special protection to retain its intense colour and luminance. 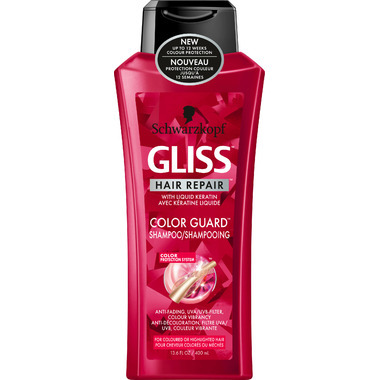 GLISS™ Color Guard™ Shampoo – specially developed for coloured or highlighted hair. This formula with COLOR PROTECTION SYSTEM and UV filter, helps seal colour from washing out for optimal colour retention and beautiful luminance. Shampoo hair using GLISS™ Color Guard™ Shampoo.